The Bradley M2/M3 A3 upgrade. 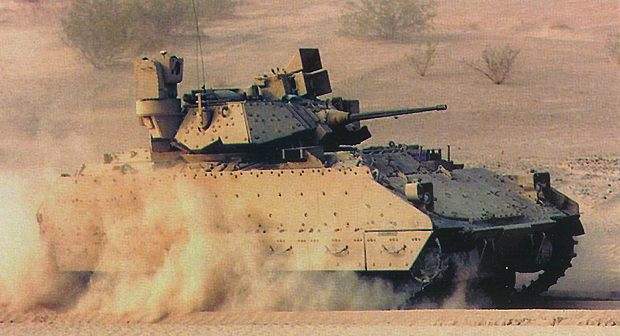 The Bradley M2/M3 A2 variant heavily deployed during the Gulf war. The role of the Bradley M2 infantry fighting vehicle is to transport infantry, provide fire cover and suppress enemy armour. Sophisticated technology provided significant design improvements beginning with the Bradley A1. Maximum ground speed is 66km/h. An M2A3 Bradley at Fort Hood. The Bradley M2A3 fighting vehicle. 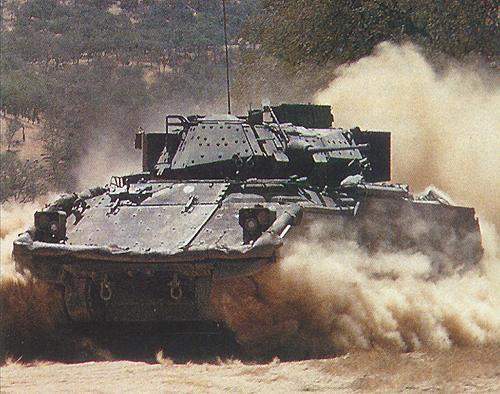 The Bradley fighting vehicle is manufactured by BAE Systems Land & Armaments (formerly United Defence) and includes the M2 infantry fighting vehicle and the M3 cavalry fighting vehicle. It is in service with the armies of the USA and Saudi Arabia. Since 1981, 6,720 vehicles of both types have been fielded. 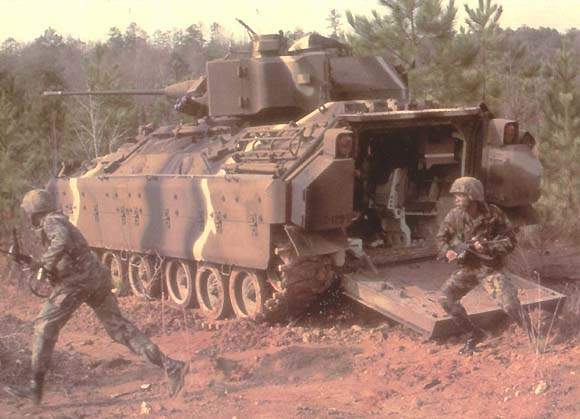 The role of the M2 infantry fighting vehicle is to transport infantry on the battlefield, to provide fire cover to dismounted troops and to suppress enemy tanks and fighting vehicles. The M2 carries three crew, commander, gunner and driver, plus six fully equipped infantry men. The M3 performs scout missions and carries three crew plus two scouts. 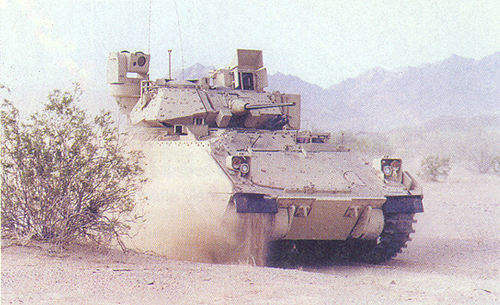 The US Army A3 Bradley upgrade programme includes improvements based on operational experience in the Gulf War. The first low-rate initial production M2A3 / M3A3 Bradley was delivered in November 1998 and entered service in April 2000. The system was approved for full-rate production in May 2001. The upgrade of 120 vehicles (80 M2A3, 29 M3A3 and 11 A3 BFIST fire support) was ordered in February 2005. In June 2005, a contract for the upgrade of an additional 450 vehicles to A3 standard was placed. Over 3,390 vehicles have been upgraded by October 2010. 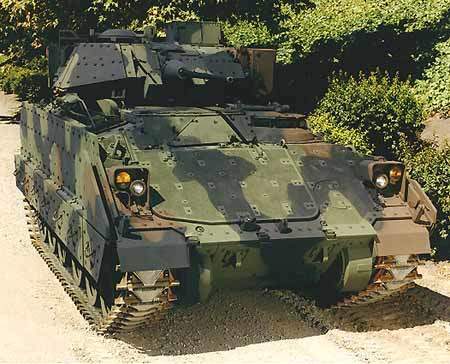 In October 2010, BAE Systems was awarded a $91m contract to replace the old and damaged systems of the 552 Bradley vehicles of the US Army. 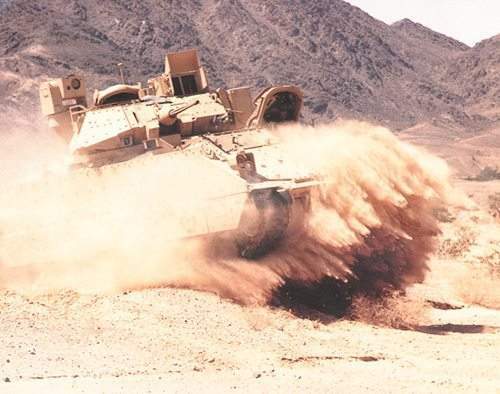 In November 2010, the US Army placed a $250m contract to procure long-lead items for 247 Bradley Operation Desert Storm Situational Awareness (ODS-SA) vehicle conversion kits. A total of 202 kits have been used for the conversion of Bradley ODS vehicles to the Bradley ODS-SA configuration and remaining will be retained for future vehicle conversions. A further $270m contract was awarded for the conversion of 245 ODS-SA vehicles in October 2011. 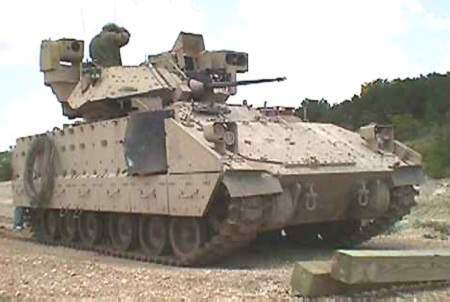 In February 2011, BAE Systems received a $47m contract to update 95 Bradley vehicles with new equipment and technology. In August 2006, a follow on contract was awarded for 96 vehicles (57 M2A3, 16 A3 BFIST and 22 A2 ODS BFIST) and, in November 2006, for 610 vehicles (490 A3 and 120 A2ODS). In July 2007 a further 172 vehicles (108 A2, 60 A3, four BFIST) were contracted. The US Army’s requirement is for 2,545 upgraded Bradley A3 vehicles. The upgrade includes the improved Bradley acquisition system (IBAS) for the TOW missile from DRS Technologies and commander’s independent thermal viewer (CITV), from Raytheon which use second generation thermal imagers derived from the US Army’s horizontal technology initiative (HTI). The imagers are based on a 480×4 scanning infrared focal plane array. The IBAS also has day TV and direct view optics, automatic dual target tracking, eyesafe laser rangefinder and two-axis stabilised head mirror. The thermal imaging DRS Technologies driver’s vision enhancer (DVE), ANVAS-5, uses a 320×240 uncooled ferroelectric scanning array. A combat identification system is being installed. The electronics system includes a databus with central processors and digital information displays for commander, driver and squad leader. Under a contract awarded in January 2008, BAE Systems supplied 952 Bradley urban survivability kits (BUSK). BUSK includes: high-powered, hand-held directional spotlight, sight protection for the turret external optics consisting of a mesh encased in a steel frame and a lightweight, non-conductive ‘dome tent’ structure to protect turret and crew from low-hanging electrical power lines. A commander’s light automatic weapon (CLAW) – a 5.56mm light machine gun integrated with the A3 fire control system and fired under armour – is under development for the BUSK as well as additional armour to counter the effects of mines and improvised explosive devices (IED). Syracuse Research Corporation is supplying CREW-2 electronic warfare systems for 1691 Bradley vehicles. CREW-2 is designed to jam remotely controlled IEDs to prevent the detonation of roadside bombs. Under contracts placed in October 2008, BUSK also included fire detection/suppression systems and advanced survivability seats. 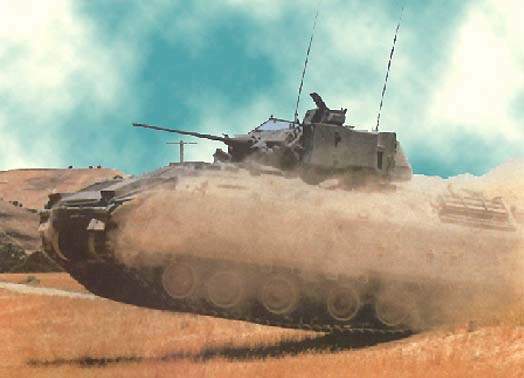 In June 2004, DRS Technologies was awarded a contract to provide systems including rugged appliqué computers for the M2A3 Bradley and M1A2 Abrams tanks as part of the US Army’s Force XXI battle command, brigade and below (FBCB2) programme. FBCB2 is a digital battle command information system which provides enhanced interoperability and situation awareness from brigade to individual soldier that will be used in conjunction with the Army’s tactical internet. The gunner is equipped with a Raytheon integrated sight unit (ISU) which includes a day / thermal sight of magnification ×4 and ×12. An optical relay provides the image of the gunner’s sight to the commander. The gunner also has periscopes for forward and side observation. A daytime sight system for the gunner or commander is provided as backup to the primary sight. The driver is equipped with three forward periscopes plus one periscope to the left. The central periscope can be replaced with the Northrop Grumman (formerly Litton) AN/VVS-2 driver’s night viewer with a 25mm second-generation image intensifier. Upgraded M2 Bradleys are equipped with the DRS Technologies driver’s vision enhancer (DVE). The main armament is a ATK Ammunition Systems (formerly Boeing Ordnance) 25mm M242 Bushmaster chain gun. The M242 has a single barrel with an integrated dual feed mechanism and remote feed selection. The gunner can select single or multiple shot mode. The standard rate of fire is 200 rounds a minute but the gun is optionally converted to 500 rounds a minute. An M240C 7.62mm machine gun is mounted coaxially to right of the Bushmaster. The M2 Bradley is equipped with the Raytheon TOW BGM-71 anti-tank missile system. The twin-tube TOW launcher is mounted on the left of the turret. The target is tracked using an optical sight, which detects the infrared signal from the back of the missile in flight. A double-wire command link between the missile and the gunner is dispensed from two spools at the back of the missile. The launcher sends flight correction data to the guidance system on the missile via the command link. The range of the TOW missile is 3.75km. The Bradley is equipped with two M257 smoke grenade dischargers, each loaded with four smoke grenades. It is also fitted with an engine smoke-generating system. The hull of the M2 is constructed of welded aluminium and spaced laminate armour. In addition, the M2A2 / M3A2 Bradleys have appliqué steel armour with provision for additional passive armour or explosive reactive armour (ERA). General Dynamics Armament and Technical products has developed an enhanced-capability reactive armour package for the Bradley. 150 sets have been delivered and a follow-on contract for 168 sets was placed in July 2005. Rafael Armament Development Authority, Ordnance Systems, of Haifa, Israel, is sharing 50% of the production. The ERA consists of 96 tiles fixed to the sides, turret and front of the vehicle, which enhance protection against a variety of anti-armour munitions including shoulder-launched rocket propelled grenades (RPG). In September 2008, BAE Systems was awarded a contract to install improvised explosive device (IED) mine armour on 433 Bradley M2/M3 vehicles. Under a $62m contracts placed in April 2011, the vehicle will be fitted with energy absorbing seats, laser designation and other survivability systems. The Bradley is equipped with a VTA-903T engine from Cummins Engine Co of Colombus, Indiana. The hydromechanical transmission HMPT-500 from Combat Propulsion Systems, a Division of L-3 Communications, provides three speed ranges. The engines provide a maximum speed of 66km/h. All Bradleys are amphibious. Earlier models are equipped with a water barrier, which is fitted by the crew before entering the water. A3 models have an inflatable pontoon which fits on the front and sides of the vehicle. Water propulsion is provided by tracks and the Bradley can attain a maximum speed of 7.2km/h in water.